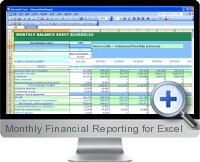 Monthly Financial Reporting for Excel provides month by month budgets that produce your profit and loss income statement forecasts, balance sheet forecasts, cash flows, monthly bank covenant balance forecasts and the key financial ratios. Profit/loss forecasts provide monthly earnings before interest and tax per share and after tax earnings per share. Fixed asset capital plans based on annual budgets. Generate monthly balance sheets, adjust receivables, payable and inventory levels. Number of shares issued and Net Asset Per Share automatically generated from starting shareholder base and share issue plan. Banking ratios and month end balances are calculated to support loan and overdraft covenants.